There is a recent metagame shift in the Terran vs. Protoss match up. Terran players who advance to the later rounds of the WCS tournaments tend to opt for economical builds. This post is about how Terran has ended up with such adaptation. Ever since one barracks expand into two Medivacs timing has been discovered, it has been the bread and butter in TvP. This has carried over to Heart of the Swarm with minor changes in the openings. Instead of gasless one barracks expand, one barracks Reaper expand has been the most common build in TvP in Heart of the swarm. It is a great build as it allows you to scout for proxy around the map and Protoss’ main beyond Scv’s scouting time. There are various variations of 12/12 Reaper opening. There are two main options after a Reaper expand: factory or barracks. If you choose to get factory then starport, it shapes up to a Marine + Widow Mine + Medivac attack. On the other hand, you can pull Scvs out of refinery for more mineral and go for a standard barracks before factory build. Let’s use a standard barracks before tech path option as the benchmark as it resembles the conventional one barracks expand. Terran moves out with two Medivacs at around 10:00. When you reach opponent’s base, the first Colossus should just pop out. There isn’t much you can do. It is hard to do a two-pronged attack with a drop in the main, and attack at the natural. Opponent has to make a critical mistake in order for it to be effective. The photon overcharge makes it even harder for Terran find a location to attack. Thus, most players just tend to deny and delay Protoss’ third, which may not be effective if Protoss plays it patiently. The game then shifts in tempo once Protoss has the key upgrades like charge. Protoss will push Terran back and get a third. 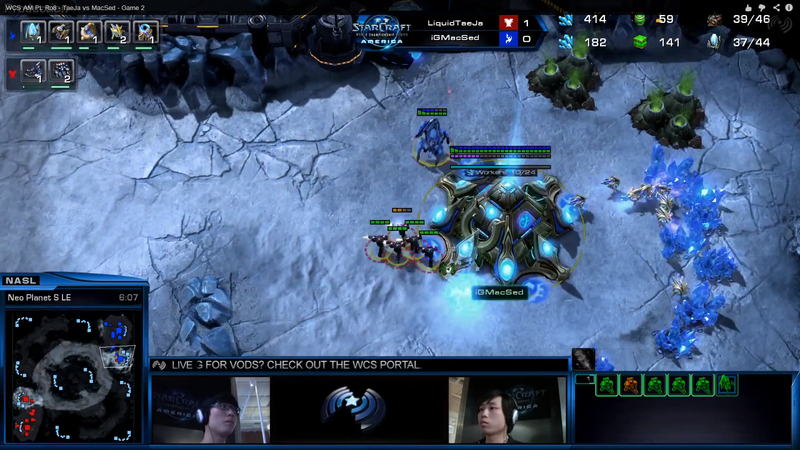 Terran then has to face the late game Protoss, which is more favorable toward Protoss than Terran. As for the early Widow Mine aggression play, it has evolved since its early days in Heart of the Swarm. In the past, Terran would fly a Medivac in with two Widow Mines and four Marines. For a period of time it was effective as Protoss players were still learning how to deal with the Medivac speed and Widow Mine. As time goes by, Protoss players use the photon overcharge to target the Medivac to shut the aggression down. Moreover, a photon cannon is built at the mineral line to hard counter this move. As a result, Terran players adapt to this and just walk to opponent’s natural with Marines and Widow Mines as shown in the video below. The trade is important for the subsequent standard push timing with stim and Medivacs. It forces Protoss to use the energy of the Mothership Core for photon overcharge, as Protoss often cut corners and not have enough units to defend against the Marines and Widow Mines. By forcing the photon overcharge early on, it opens up mid game offensive window that a typical opening which I mention earlier does not have. Forcing photon overcharge has become a norm in TvP at the top levels for various builds. Even if Terran do not go for Widow Mine, they still force photon overcharge with a group of Marines. Polt even improves this further by getting an early Marauder with concussive shell to pick off as many units as possible when forcing photon overcharge. Still, it is hard to be aggressive against against Protoss who stay on two bases in the mid game. The Terran players who play in the WCS finals last weekend had all used 14CC builds against their Protoss opponent. The build basically goes for 14CC into two barracks. Then, a third barrack before two refineries. Subsequently, it shapes up to the standard convergent point of three barracks, one starport and one engineering bay. What are the differences between 14CC and 12/12 Reaper? The obvious difference is that 14CC does not have a Reaper to scout around the map. If there is a proxy, it is likely to be stargate. 14CC into three barracks should do fine against Oracle even if you do not scout it due to its high Marine count. However, it is more vulnerable to other forms of all-in or special builds like blink Stalkers and Dark Templar as you do not have a Reaper to hop into opponent’s main. TaeJa provided a great answer to the lack of intel for 14CC build by sending Marines to force photon overcharge early. He sent just five Marines to see what units Protoss has. If you see quite a number of Sentry, then a burst is coming. If there is a high stalker count, be prepare for blink. If there is minimum number of units, it could be a tech, you can choose to scan. The advantage of 14CC is that it does better against a two base Protoss than a Reaper opening. You simply have more units and it is harder for Protoss to split up his units to defend in mid game. You also get your third command centre earlier than normal as you have more mineral (as early as before 9:00). It opens up another window when Protoss gets his third, and you have a +2/+2/+1 timing. With better economy, which leads to much more units, you can be aggressive against Protoss even in a straight up battle (before storm). In the some of the games listed above, Terran players sometimes get an early third command centre before a third barrack and refinery. Nevertheless, it emphasizes on economical advantage since it is hard to be aggressive against Protoss in the mid game. Terran has two main problems in TvP. It allows Protoss to cut corners and be safe. It is hard for Terran to be aggressive. It stems down from the first problem, the game will move to late game without much damage done to both sides. Late game Protoss is hard to deal with. The economical approach, along with various tactical movements like forcing photon overcharge, attempts to solve these issues. Still it involves good multitasking and decision making (knowing where the gap of defense is) in the mid game to break Protoss. If you cannot prevent a late game situation, at least you should aim to get into the late game with an advantage. Great post! Really makes me realize how little game knowledge I have. I just coast by on mechanics. It feels harder and harder to skate by on one or the other as a Terran these days. I am more decision making strong than mechanics but I feel the games I win are when both skills line up. I find it hard to know what is coming at times and defend.